DM Fatigue AKA DM Burnout, is a common condition experienced by many a runner of games. We the Dungeon Masters of the world are the bearers of multiple tiny universes that exist in our heads. It is our job to paint the picture for you and tell you exactly how things go. We set the stage and create the characters. We are the directors, actors, grips, and the administrative assistants of our worlds. We have no help, we need no help (usually). There are a lot of cogs, springs and fly wheels that go with running kingdoms in your head. Every action the players take have ripple effects. Don’t believe me? Slaying a marauding dragon and taking its hoard is a good example. You seize a fortune in gems, gold, magic items and general paraphernalia. There are so many things that can happen here but let’s explore a potential scenario. Example: You build a base of operations with the funds. In this example the party buys (or is granted) land and builds a keep or some sort of permanent structure used as a primary base of operations. A place you can relax between adventures. You hire servants and you oversee the surrounding land. Your monetary means are going back in to the kingdom you invested in. Your lands are worked by farmers and craftsmen that all grant you an amount of taxes used to recycle in to the surrounding area and keep things up to date. Depending on the way you go you could either be benevolent rulers or complete dicks. Either way has consequences for the lands, the kingdoms, the surrounding area. Your dungeon master has to take in to account the monster population in the area, raids, rival kingdoms, or even the dragon’s rivals that may want to claim the horde for themselves. What if this new found fortune makes the players a target for ye olde ponzi schemes? What kind of followers will the players attract? What will the gaining kingdom get in return for this investment? What are the reactions to the player’s attitudes? There are so many questions and answers we must balance and manipulate to keep things rolling. Bottom line is that for all of your planning your players can destroy hours or even days of hard work in one minute. A good DM is ready but even the best of us are susceptible to the dreaded burn out. 1. Planning is no longer fun, it is a chore. 2. Irritability with your players. 3. Questioning every decision your players make. 4. Railroading (to a degree). 6. Lying to players about their success or failure. 7. Making it a point to try and kill the Player Characters. The best thing to do when faced with DM Burnout is to step back or even step down. Take a break and let someone else DM. Play a different game or even pull out some board games. Start a side game that is different from the main campaign. Run a pre-built module. There are so many things you can do as DM. As a player make sure to give your DM some slack. 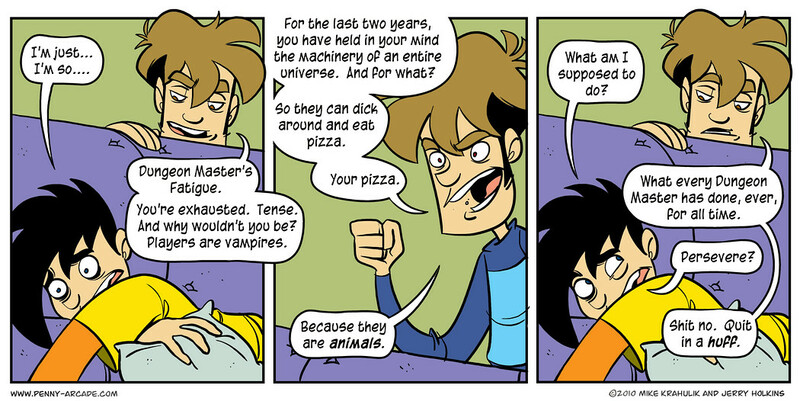 They’re the Dungeon Master, they create worlds. ~ by lordnightwinter on May 21, 2015.